We might as well get that story out of the way first and foremost, because it’s going to be one of the only positive things in this entire pre workout review. So. I had max with me at Peet’s today, and the guy behind the counter was doing a MILLION things. Max jumped up onto the counter, while I was obviously buried in my phone snapchatting, and was literally DRINKING this women’s iced coffee! I can’t even make this stuff up guys. Legit drinking this women’s coffee. I finally realized what was going on and pulled him by the scruff off the counter. But while I was reprimanding him, the woman came by, got her coffee, and took a sip!! Unbelievable!! Omg I had to chase her down, tell her what happened, and request that she please not sue me. Ugh. What a way to start the weekend, right? But it would only get worse from there- that’s the bad part! And it got worse because of Women’s Best. As you know from my other Women’s Best reviews, I’ve been pretty dissatisfied with their products so far. They just don’t know how to make supplements over there in Europe yet, that much is clear. But they clearly have enough money to pay off every halfway decent looking babe on Instagram, so I really wish they would spend more money developing their products instead. But. What can ya do. My girl Jess had some of the pre workout booster (of course she always falls for the Instagram marketing), and you know I would never actually buy another Women’s best product after my ordeal with the Women’s Best Slim Shake. (Read my full Women’s Best Slim Shake Review here). But. Yeah it was just really bad. And guess what. The pre workout is just as bad, if not worse. I’ll start the embarrassment with a flavor review. Women’s Best Pre Workout Tastes Atrocious. Strong language for a pre workout that tastes strong. And not in a good way. The ‘Crazy Fruit’ flavor, which is a dumb name first of all, tastes like rotten pineapple mixed with the most stale artificial berry flavor you’ve ever tasted. I seriously am not sure if I’ve ever had a worse flavor. The first sip or two of Women’s Best Pre Workout Booster you are like…meh this is not great but I can deal…and then by the third the aftertaste just sticks with you and is so horrible. Ugh. I can’t even. 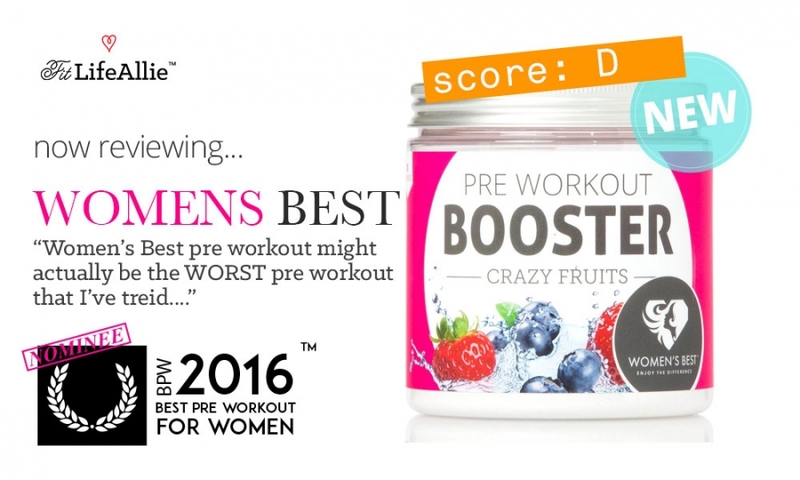 Women’s Best Pre Workout Booster tastes so bad and artificial. Not surprisingly it has artificial sweetener in it. So I guess we might as well discuss how bad this formula is while we’re getting into the ingredients. Did I at Least Have an OK Workout with Women’s Best Pre Workout? Not really. And I don’t even really have much more to say about it. I went in, did my standard warmup which is the treadmill sprint circuit for five reps through. Just waking the whole body up. And then I was like, maybe two warmup sets into my workout when my energy just dropped so dramatically that I thought someone has shot me with a tranquilizer gun. And I’m not kidding. I was so dogged that Sarah was like…’Allie are you high?’ LOL. Seriously! I was moving so slow that she thought I was actually high in the gym. For what it’s worth, Sarah said she had a good workout on Women’s Best Pre Workout Booster, so, I don’t know. Maybe I was still shaken up by Max drinking a women’s COFFEE at the freaking coffee shop. Lol. But. I bet if you’ve never ever taken a pre workout before you MIGHT have a decent workout if you try out Women’s Best Pre Workout…but I seriously am not sure why you would ever go with this pre workout when we have SO many better options available to us here in the U.S.A. So. Call me anti-Europe if you want, but those guys have got NOTHING on good ‘ole AMERICAN supplement companies. (insert flexing emoji here). Women’s Best Still Has Nice Packaging. I’ve said it before in my Women’s Best Slim Shake and Women’s Best Burner Caps Review…this company, for all it’s faults, knows how to make one darn good looking product. The pink over clear bottle is just crisp and original. It’s something you don’t see everyday. The Women’s Best logo still leaves something to be desired, but the overall aesthetic still is pleasing. I don’t know that the pre workout conjures the same level of emotion as some of the others, because they did make a bit of a departure from the standard pink background to use some white, with some pretty horrible fruit flavor graphics beneath. And. Yeah. I’m just not QUITE as pleased with it visually as I have been with some of their other efforts. Women’s Best is the company that I love to hate. The big German machine. It’s the Goliath to all other companies’ David. I think they’ve probably steam-rolled quite a few competitors into submission…but the fact of the matter is they’ve done it with inferior products, case-in-point, the Women’s Best Pre Workout Booster.